When you near the end of your PhD or postdoc project, you aim at wrapping up all projects and results, so that you get the last results and manuscripts submitted. And you likely do not manage to finish everything, and interesting work and results therefore remain unpublished. So what do you do? 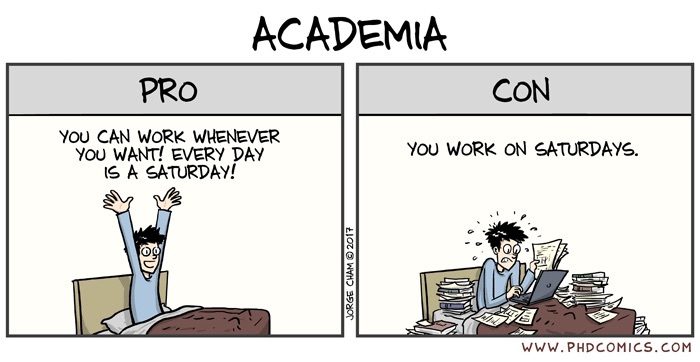 If you stay in academia, you spend time during your next employment to finish that work. Publications are the currency in which you are assessed in academia, and finishing almost-ready work for publication is therefore crucial. I’ve heard of people that spend, more or less, the entire next academic employment to finish and publish work from previous projects. If you leave academia, you need to decide if you want to put in the time and energy to finish the work and publish it. You may decide to do so out of pride of your research work, or to continue to publish if one day you wish to return to academia. When I left academia, I received the latter piece of advice more than once – “continue to publish in case you change your mind and wish to return to academia”. I have not changed my mind and do not plan to return to academia, but have nevertheless continued to publish on topics and with colleagues from my PhD field. And for how long should this time- and energy-consuming activity continue? For most people that have left academia, their new job will not be related to the on-going academic research, and they need to find time outside of the normal work hours, for example in the evening and on weekends. Before deciding whether to continue to publish, you thus need to decide if you are willing to invest spare time and energy that you could otherwise spend on your family, friends, or other projects and activities. Another challenging aspect is that you do not see your collaborators – your former colleagues from academia – in person, as you used to when you were working in academia. Instead you communicate with them via e-mail and maybe occasionally on Skype, which can be a source of misunderstandings and delays compared to simply dropping by your colleague’s office to clarify or discuss. For example, one evening or day during the weekend you may decide to work on the project, only to find yourself missing input or information from your collaborators. You send an e-mail to get the missing input, and most likely you don’t get it right away. Then, when you received the information, you need to allocate another evening or weekend day, as well as the required mental energy, to make progress towards finishing the work. A key problem with this way of working is that good ideas in research don’t just happen because you decide that they should. You cannot expect that because you allocate two hours for research one evening, that great ideas and clever interpretations will magically show up. Creativity in research requires time and reflection. I have more than once found myself frustrated because of these contradicting interests. On the one hand, I want to be thorough and deliver quality input for our projects and publications – and on the other hand, I do not want to spend all my spare time doing this. So, how long to continue publishing? I continue to work on academic publications for two main reasons: Because I want to finish work that we initiated during my PhD properly, and because I find it fun and inspiring. If, because I do not want to spend too much spare time working on it, I rush to be done, it will neither be proper, nor fun. And then there is no point in spending any time on it at all. So, for how long should this spare-time-consuming and just-for-fun academic publishing continue? I don’t know. Currently, a few such publication projects are underway, and I’m not ruling out to engage in other projects with my former colleagues from academia. But one year of experience with post-leaving-academia research work and publishing taught me that it is demanding and time-consuming. It requires many hours of concentrated work and reflection, and I’ll consider very carefully which projects I might engage in, to make sure that it remains fun and rewarding.